We’re winding down summer with the James Taylor concert, Texas Legends basketball camps, a movie-making camp, and lots of art camps for kids and adults… all This Week in Frisco! James Taylor at The Ford Center, The Star – Tonight, you don’t want to miss seeing this legendary singer/song-writer James Taylor & His All-Star Band with special guest Bonnie Raitt and her band. At 7:30pm, this will mark the first concert at Ford Center. Frisco RoughRiders vs. Midland Rockhounds – First pitch thrown at 7:05pm in Dr. Pepper Ballpark. Live Trivia Night – Stan’s Main Street at 6:30pm. Chant Duplantier performs Live – Frisco Railyard at 7pm. Budding Artist Mini Camp – Join House of Hadley Kate this summer with one of our mini camps. Their Budding Artist camp is perfect for those who love to get creative! For children ages 6 and up, $42.95. Mark Shelton performs Live – Stan’s Main Street at 7pm. Cast Iron Soul band performs Live – Frisco Railyard at 7pm. Summer Dive-In Movies at the FAC – Float in the pool and lazy river while you watch “Finding Dory” under the stars at the Frisco Water Park at the FAC, 5828 Nancy Jane Lane. Friday night family fun can’t get better than this! TICKETS go on sale Friday, May 19! Gates open at 8pm. $10 per person; children under 2 are free, but must have a ticket for entry. Water features will remain on until the movie starts at sunset. Concessions stand will be open. Tyler Rogers Band performs Live – Frisco Railyard at 7pm. Acrylic Painting Techniques Workshop – This workshop series by Misty Oliver Foster’s Fresh Paints Studios is designed to help you explore new techniques for creating texture, depth and brilliant color in your acrylic paintings. Learn about different types of acrylic paints and media. Cake Decorating Classes – Yes, you can have your cake and eat it too! Cake Decorating Classes are back at Celebrity Bakery, 9255 Preston Road, Frisco. At 3pm, 4:30pm, and 6:30pm. Benefiting Frisco Arts. Frisco has so many interesting things going on that generally I don’t see a reason to venture south of 635. Much less go completely out of town. We have staycation, date night, amusement, and adventure completely covered. I don’t want to take for granted, however, that Frisco’s North Texas location is a perfect jumping off point for an easy road trip. Travel east a bit, and you’ll find miles and miles of dense evergreen trees. Travel south and you’ll arrive in the Texas Hill Country with whitewater rafting and numerous wineries. Three of our four bordering states are just an arms’ length away. So, next time you’re feeling an itch to travel, don’t bother looking at AA.com. Just fill up your tank, and hit the highway. Make some memories (and a quick stop at Buc-ee’s, obviously! ), and you’ll be glad you skipped the airport in favor of a road trip. About 280 miles from Frisco, in the gorgeous Texas Hill Country, Fredericksburg is a rustic, country escape from suburbia with a German influence. Fredericksburg is known as the “epicenter” of the Hill Country wine region. Here you’ll find over 40 wineries, breathtaking sunsets, spas, shopping, and bed and breakfasts. It’s a little bit like watching a romantic Hallmark movie. Fredericksburg doesn’t only cater to couples weekends or girls’ retreats, however. Families will find a lot to enjoy here too such as hiking the majestic Enchanted Rock or the wide selection of Hill Country outdoor sports (white water rafting and Jeep off-road tours, for example). About 170 miles from Frisco, Broken Bow is a dream location for those who appreciate a good nature hike and cozy cabin life. It’s the home of the beautiful Beavers Bend and Hochatown State Parks, and chock full of gorgeous upscale private cabins and lake activities. I’m dreaming of hosting family Thanksgiving here one day complete with s’mores and sing-a-longs. For a complete change of scenery, head to East Texas and marvel at the stately evergreen trees that surround you. A quick 120 miles from Frisco, Tyler is a small town with a sophisticated personality. Tyler is best known for its State Park, Rose Gardens, and historic homes. Lake Tyler offers recreational opportunities such as Tyler Paddle where you can rent paddle boards or participate in moonlight and yoga paddling. Unknown to most, East Texas is home to many wine vineyards, the most popular of which is The Kiepersol Winery, in Tyler. Growing up, I spent countless summer vacations and holidays traveling in the back seat of my parents’ station wagon to Hot Springs, Arkansas. To Grandmother’s house we go… playing the license plate game all the way. As an adult, I now realize how fortunate I was to travel to this beautiful State Park with such frequency. About 300 miles from Frisco, this small town offers big adventures. You can unwind in the historic thermal bath houses, or enjoy the numerous lakes, mountain hiking trails, and the Oaklawn Horse Racing park. Downtown Hot Springs is charming and adorned with lights during the Christmas season. The best way that I can describe Austin is this: It’s Dallas meets Chicago meets Denver meets San Francisco. Oh, and throw a little Washington D.C. in there as well because it’s the Texas State Capital. Austin is an easy 3 hour drive from Dallas, and I never feel quite cool enough to hang out there because it’s just so… COOL. The truth is, however, Austin is a very welcoming city. The various entertainment districts will engage every one of your senses. Restaurants, the arts, street markets with unique handmade goods, and let’s not forget the live music scene. Austin has become nothing short of the “Music Capital of America.” Perhaps you’ve heard of Austin City Limits or South by Southwest (SXSX), but they are just two of the many music festivals hosted by Austin each year. Austin loves its outdoor sports as much as its music, so bring your bicycle and plan to ride the ten miles of trails which border Lady Bird Lake in downtown Austin. If the rich daytime culture and hot night life aren’t enough to lure you to Austin, just remember that you might bump into resident Matthew McConaughey – which in my opinion, is completely worth the trip all on its own! So pack it up, Frisco, and hit the road before school starts again! 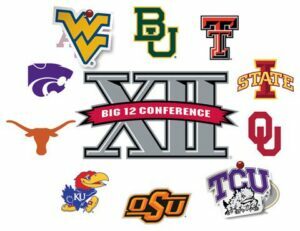 Last week, on July 17 and 18, the Ford Center hosted the “2017 Big 12 Conference Football Media Days” for the first time. Judging from the reception the venue received from coaches, media, and players in attendance, The Star might be the new home for the two-day college football extravaganza. The wide-open setup at Ford Center gave the Big 12 organization plenty of room to create an event to remember. On the north end of the field sat a huge stage where coaches and other conference officials held press conferences on Monday and Tuesday. The area in front of the stage had rows of tables for media members to cover the event. The south end of the field held a number of tables on platforms where coaches and players from the 10 members of the Big 12 hosted “breakout sessions” with members of the media each afternoon for informal conversations. Fox Sports Southwest televised the proceedings on both days with one big set where hosts Ric Renner, Gary Reasons, and Robert Smith conversed with Big 12 coaches and players, but Fox also had a smaller set for additional interviews. As someone who has attended media days for several different outlets, the setup at The Star, including the catered lunch served both days at the south end of the field, was outstanding. Media days tend to mark the official start of the college football season and this year’s Big 12 gathering was no different than past events in that there was plenty of news to discuss. One big storyline was the first appearance of new Oklahoma head coach Lincoln Riley who replaced iconic Sooners coach Bob Stoops upon his retirement earlier this summer. And, those covering Texas wanted to hear everything the Longhorns new head coach, Tom Herman, had to say about how he has changed the culture in Austin in only a few short months. One of the more interesting stories to come out of the event was from U.T. Austin junior defensive back, PJ Locke III. 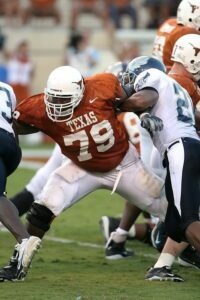 Locke learned a hard lesson on how seriously Herman and his staff are about training when he had to wake up at 4 AM to do extra drills and clean the weight room after his water bottle fell out of his bag at the team facility. In the past, Big 12 Football Media Days has been held at an upscale hotel, which made for a nice setting, but having this event at Ford Center raised the bar for future such gatherings. What did the players think of the new setup? Well, West Virginia running back Justin Crawford came away impressed with what he saw at The Star. It’s nice. I’ve never experienced anything like this,” Crawford said. Will the Ford Center become the permanent home for Big 12 Football Media Days? One rumor floating around was that the conference is regarded as the best when it comes to college football. The Southeastern Conference, or SEC, whose media days spanned four days in suburban Birmingham this summer is now considering a move of its event to another setting… maybe even to Frisco. The Star is about to celebrate its one-year anniversary. In that time the entire complex, especially the Ford Center, has hosted its share of outstanding events. Big 12 Football Media Days is the latest addition to that list. Hopefully, the first of many such proceedings held here in Frisco each July. Looking for a place where you can hang out with your kids, but that also has amenities for adults? Look no further than Jungle Joe’s, a one-of-a-kind kid-friendly creation by Angela Holt. YOU can relax, take a break, have a healthy bite to eat, and maybe even get some work done on their free wi-fi! 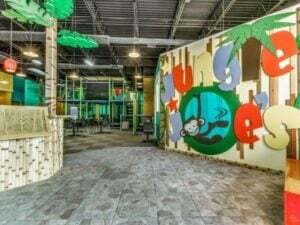 Unlike other large children’s play facilities, Jungle Joe’s is a smaller space where you can see your child play from almost any angle in the facility, but also with the added assurance of CCTV cameras that offer a full view of the entire play structure while your kids run and hide. In addition, the whole area of jungle gyms, slides, and toys are sanitized every night and the structure is also cleaned regularly during the day. Jungle Joe’s welcomes kids from toddlers (even under 1 year old) up to 8 or 9 depending on the child. It’s not that the structures can’t hold them at an older age, it’s just that they might start getting a little bored with the Thomas the Train play table, the coloring station, and the chalkboard wall once they’re 8 and above. On a typical day, parents will need to stay on the premises, but Jungle Joe’s does have select “Parents Night Out,” especially after the summer season ends. What made Angela start Jungle Joe’s? Years ago, Angela received her teaching degree in special education. But, after a 16-year career in real estate brokerage in California, she and her family returned home to Texas and set about following a dream to start a vocation that was centered on children but wasn’t a teaching position. Realizing that she most wanted to start her own business, Angela and Rick, her husband, spent time looking all over the North Texas area for an ideal location to set up what they describe as “an imaginative playtime paradise.” Their son, who’s now 8, really was the “taste-tester” for play-scapes, contributing tons of kid-centric ideas based on play places he had visited and what sparked his interest for fun, active play. Jungle Joe’s officially opened on June 9, 201, at the corner of Hillcrest and Rolater in East Frisco. We all realize that most small businesses don’t last long, so getting through the first year deserves a big congratulations. So does filling a void in the marketplace… We’ve all seen the play spaces your kids can experience at Chic-Fil-A or McDonald’s, and then you have your neighborhood park’s jungle gym. Jungle Joe’s serves the desires of the child (play-scape) AND the requirements of most parents (healthy food options, wi-fi access). Breakfast menu items every day like baked oatmeal and breakfast tacos. Jungle Joes’ is a TRUE made-to-order cafe, and they DO have hot dogs and chicken nuggets if your kids (or you!) have a craving. Speaking of cravings, let’s talk about the coffee bar! Get your caffeine fix or order from an assortment of juices, sodas, and water. Plus, after your snack of choice, with the free wi-fi, you can work a bit while the kids keep playing. What Play Options Are There? 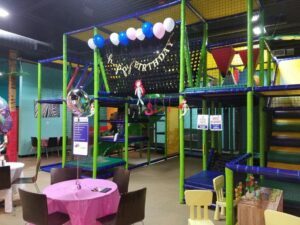 Besides regular play hours of Monday through Thursday 9am to 6pm, Friday through Saturday 9am to 8pm, and Sunday 11am to 6pm, you can have your child’s birthday party at Jungle Joe’s starting at $179 and going up from there. For the first 45 minutes, the kiddos come in, run around, and play. For the next 45 minutes, they go into private party room where you can have food from the cafe. Top the day off with a Jungle Joe’s birthday cake! Or you can bring in your own cake or cupcakes. Jungle Joe’s also offers completely private events where you can have all of Jungle Joe’s to yourself! They’ll even decorate for you. Always providing a party host to take care of everything, parents can RELAX… it’s all handled. Then there are the “specials” at Jungle Joe’s… From Monday to Thursday, come out and enjoy Happy Hour from 2pm to close with HALF OFF admission and half off any drinks, excluding smoothies. There’s also “Kids Eat Free” Fridays with the purchase of one adult meal, so plan your Friday night dinners here and play ’til 8pm! Every day after 2pm, Angela promotes some kind of special, discount, or deal for parents. Jungle Joe’s is where the fun starts and the play goes on! Find them and friend them on Facebook and Twitter! August is almost here and summer is winding down, but we’ve got a MAJOR hotel grand opening, flower arranging class, live trivia, peak performance training, and the 2nd Annual Big Shot Shootout… Coming up This Week in Frisco! Omni Frisco Hotel – GRAND OPENING DAY! “Summer Fling” at Simply Blessed Flowers – From 6pm to 8pm, Learn the basic skills to design your own bright and vibrant flower arrangement. $60 per person, includes light refreshments. Register today! Neighborhood Services Brunch Served for First Time – Neighborhood Services restaurant in Omni Frisco Hotel. “2nd Annual Big Shot Shootout” at Frisco Gun Club – The Dallas Builders Association in conjunction with the Frisco Gun Club are hosting the second annual Big Shot Shootout to support Operation FINALLY HOME and their mission of providing custom-built, mortgage free homes in the Dallas Metroplex to wounded, ill and injured veterans and the widows of the fallen. Two person teams will have the opportunity to highlight their marksmanship at two pistol targets and one rifle target. Firearms and ammunition will be provided. To ensure a level playing field, no outside firearms will be permitted for use in the competition. Competitors will be able to choose from two competitive divisions, experienced and novice. Awards will be presented for the top experienced and novice teams. There will be two flights with the first flight starting at 3:00 PM and the second flight at 6:00 PM. Registration for flight one is at 3:00 PM and the competition is at 4:00 with cocktails and food afterwards. Registration for flight two is at 6:00 PM, competition is at 7:00. Cocktails and food will be available AFTER shooters have completed their round. Awards will be given after each flight. All proceeds will support the mission of Operation FINALLY HOME in the Dallas Metroplex. “4 Secrets Peak Productivity Performance” featuring Frisco Young Professionals – Do you ever think about managing your energy instead of your time? If you answered “NO” or “MAYBE”, you should join us for the “4 Secrets to Peak Productivity Performance” to understand in detail why it is more important to manage your energy levels than your time. This SPECIAL Career Ladder Institute Series is intended for Young Professionals and is sponsored by Frisco Young Professionals (FYP), a program of The Frisco Chamber of Commerce bringing the 4 Secrets to improve your productivity and also features Larry D. West III, the Young Professional Leader and author of “Young Professional Playbook” talking about Finance for Millennials. This session certainly gives you tips and perspectives that are not only easy to apply but certainly make a massive change in your career and in your life! 7pm at Dr. Pepper Ballpark – 7300 Roughriders Trail, Frisco, TX 75034. Ryan Berg Band performs Live – Frisco Railyard at 7pm. Teen Writers Workshop with Jeramey Kraatz – Learn some tricks of the trade and expand your skills with Jeramey Kraatz, author of the Cloak Society series and Space Runners. For Grades 6-12 from 2:30 – 3:30 pm on the 1st floor, Teen Room. “THE ART OF MUSIC” – An evening of wonderful acoustic guitar performances accompanying live artistic painting in a casual setting at Expedition Church, 9073 Berkshire Drive, Frisco. 7pm. Local artist, Ty Fawley, combines forces with local guitarists, John Wynn and Carlo Pezzimentifor an inspiring collaboration of music and visual art. The guitarists will perform multiple genres on both nylon and string while Ty creates an impressionist abstract painting. Ty’s painting will be projected live on a giant backdrop during two 45 minute musical sets. The showcased piece will be available for purchase via silent auction. Ty will also exhibit his artwork, also available for purchase, in the gallery at Expedition Frisco. Get your tickets! DYA Band performs Live – The Frisco Bar at 9pm. 3 Drunk Monkeys perform Live – Frisco Railyard at 7pm. Mark Sena & the Funk Machine perform Live – Frisco Railyard at 7pm. FC Dallas vs. Vancouver Whitecaps FC – Match starts at 7pm in Toyota Stadium. Night of Improv – Frisco Improv Players is an improvisational comedy troupe that specializes in game-based comedic performances, similar to those seen on the syndicated television show “Whose Line is it Anyway?” Their fast-paced, interactive improv is popular with all age groups. Come play with us at the Discovery Arts Center! Art Journaling Workshop by Fresh Paint Studio – From 11am to 4pm, this fun, mixed-media workshop is designed to allow you to be uninhibited and create freely in a relaxed environment. We will work with acrylics, watercolor, ink, collage, permanent markers, various papers, stencils and more as we walk through the process of layering images into a one-of-a-kind art journal (provided). The workshop is perfect for all levels of artists. Along the way, we will discuss how to overcome creative block, and tackle some of the obstacles to ongoing creativity. Students come away with much inspiration and motivation to keep creating after this class. Open to ages 14 – adult. $145.00 at thegallery8680, 8660 Main Street, Frisco. Sophia Annello performs Live – Frisco Railyard at 1pm. National Videogame Museum Guided Tours – Every Sunday, we offer guided tours of the museum at 1 p.m. and 3 p.m. Reservations are not required. This activity is included with the price of general admission.